MAG Ireland, the Irish Motorcyclists’ Action Group, has published a clarification on forecourt rules as regards riders being refused petrol, unless they dismounted from their bike. It was last year that a number of riders had informed MAG Ireland, that they were refused petrol unless they dismounted their bike. Filling a bike in this manner is usually carried out by riders whose bike only has a side stand fitted, so that with the rider sitting on the bike upright the bike is not leant over on the side stand, thus the petrol tank will take some more petrol on board. MAG Ireland said then, “Different justifications were put forward for this by forecourt staff when asked the reason why such a rule is in force. It appears many were under the impression that this was as a result of an EU Directive, or other statutory regulation. We reported on this article and one rider responded on our website, “Having seen a petrol spill on a hot bike ignite, sitting in a pool of spilled petrol emolliating yourself isn’t something I’d want. Also at that time we said, that we were aware of this situation and letter writing by motorcyclists here in Northern Ireland, however we have not heard anything since! 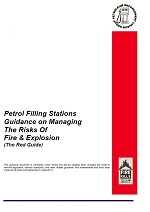 So reading through the latest from MAG Ireland it would appear guidance is published by the Petroleum Enforcement Liaison Group (PELG) in “The Red Guide”. 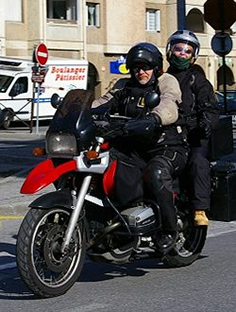 The official title of the red guide is the “Petrol Filling Stations Guidance on Managing The Risks Of Fire & Explosion”, which says that to ensure petrol is dispensed safely: “motor cyclists and their passengers should dismount from their machines”. MAG Ireland subsequently received from (PELG) a number of documents and statement that to minimise the risks to the health and safety of persons on their premises and of the ignition of explosive atmospheres, contamination of clothing with petrol, the difference of filling of motor cycle fuel tanks which is directly into the tank and not via a fill pipe as with a car leading to more risk of spillage! PELG thus provided substantial evidence to back up this position including the published advice of several major motorcycle manufacturers which advises filling the motorcycle while dismounted. As PELG and its members also cover the UK, if you are refused petrol unless you dismount your bike then you now know the reasons why! Our thanks to MAG Ireland for this information. Back in July 2012, we reported that we were seeking clarification on forecourt rules after a number of riders told us they were refused petrol unless they dismounted. You can find that post here. It’s taken longer than we’d have liked to get back to this topic, so better late than never, here’s what we learned. We first asked the HSA (Health and Safety Authority) to clarify, and they said that they do not have a policy which requires riders to dismount before filling up, but they did refer us to a guidance document published by the Petroleum Enforcement Liaison Group (PELG) in the UK (click here for PELG website). So we asked PELG for clarification, and subsequently received a number of documents from them. To summarise, PELG say that site operators/licensees have certain duties under the Health and Safety legislation which requires them to minimise the risks to the health and safety of persons on their premises and of the ignition of explosive atmospheres. “There are many recorded of cases of fires having occurred due to the overfilling of motor cycle and scooter tanks. Due to the close proximity of the tanks to hot engine parts and associated electrics, petrol vapour has been ignited either immediately the tank has been overfilled, or when the motorcycle is being restarted. The reason for the overfilling can be associated with the fact that the filling of motor cycle fuel tanks is directly into the tank and not via a fill pipe as with a car, having the nozzle placed into the fill pipe of a car enables the cut off mechanism to operate before the fuel reaches a level where it will be spilt, this is not always possible with the tank of a motor cycle, particularly when the customer is trying to top up the tank, or during times when petrol has been adapted for winter temperatures, and the fuel is more volatile. PELG have provided substantial evidence to back up this position including the published advice of several major motorcycle manufacturers which advises filling the motorcycle while dismounted. Accordingly, PELG members may continue to request that riders dismount before refueling, notwithstanding the difficulties this poses for riders of bikes fitted only with side stands. We in MAG Ireland extend our thanks to PELG for the effort they put into engaging with us on this issue. Fuel escaping from an overfilled tank could make its way onto the rear tyre. This could cause a fall.